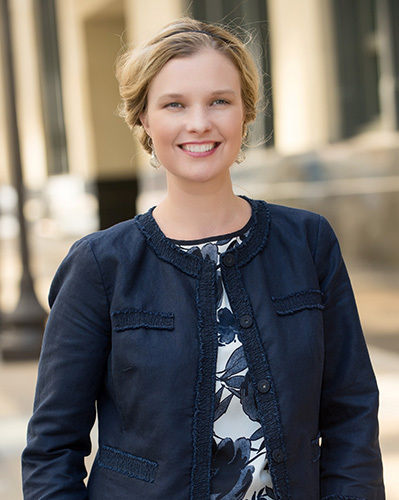 The International Downtown Association (IDA) selected Downtown Fort Worth, Inc.’s Director of Marketing and Membership, Becky Fetty as one of the industry’s 30 brightest professionals for the 2019 Emerging Leaders Fellowship (ELF) program. Becky will join senior staff members from 3 countries and 17 provinces or states in New York City, June 16-21, 2019. Alumni of the IDA Emerging Leaders Fellowship program, launched in 2016, are fast becoming sought-after leaders for the future of city building worldwide. Graduates have become new CEOs, accepted CEO positions in other organizations, and others have elevated to more senior staff levels. “Becky’s work at DFWI and her presentations at international conferences has placed her in the spotlight of the International Downtown Association. We are proud that Becky has been selected for this honor,” said DFWI President, Andy Taft. The ELF program features intensive instruction delivered by IDA partners at Baruch College, City University of New York, Times Square Alliance and Coro New York Leadership Center. The event takes place at various locations throughout Manhattan with field visits provided by several local PID leaders. The fellows learn essential leadership and place management skills and gain practical tools in the areas of place-based economic development, the live-work-play experience, and public-private partnerships. DFWI’s Planning and Transportation Director, Melissa Konur was an IDA Emerging Fellow in 2018. The International Downtown Association is the premier organization for urban place professionals who are shaping and activating dynamic city center districts. Our members are downtown champions who bring urban centers to life, bridging the gap between the public and private sectors. We represent an industry of more than 2,500 place management organizations, employing 100,000 people throughout North America and growing rapidly around the world. Founded in 1954, IDA is a resource center for ideas and innovative best practices in urban place management. For more information, visit www.downtown.org.